Liz Applegate Ph.D., (author of "Hot Stuff!" article in Runner's World), put it perfectly when she wrote "richly colored chilies are packed with a range of antioxidants, including vitamin A and vitamin C. These nutrients may aid in recovery and help prevent ailments such as Alzheimer's disease and cancer". She went on to point out that chilies also aid in weight loss, alleviate muscle pain, and reduce the risk of getting Diabetes. I don't know about you, but those are some good reasons to start consuming chilies. I like the idea of eating my vegetables to stay ahead of the curve...and staying away from medicines until I have no choice. 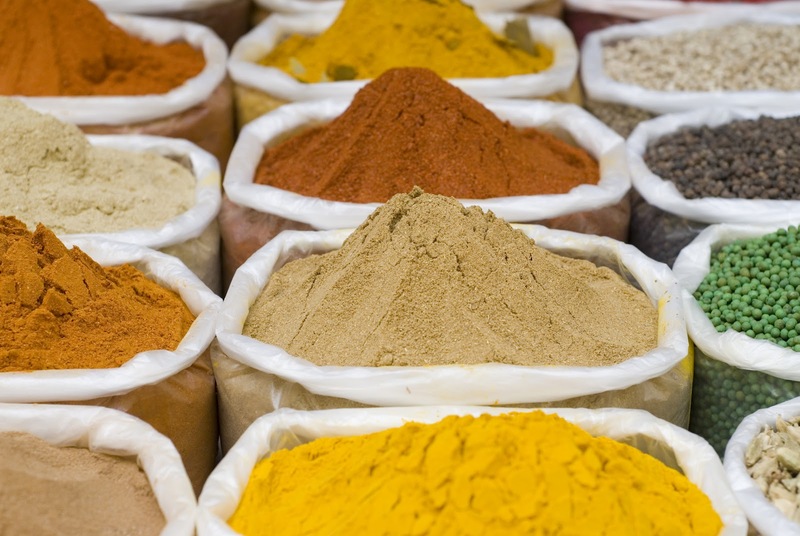 Peppers are an integral part of our cuisine's spice mix. One of my favorite dishes where peppers play an important role is Chili Poppers. It closely resembles an appetizer called Jalapeno poppers, which is most commonly found in many American restaurant menus. Another dish that is on the list is Stuffed Jalapeno Peppers, that we eat with rice because it is definitely on the hot end of the scale. On the subject of peppers, this next dish is peppers on a new scale...a more sweeter scale that is. We love cooking with sweet peppers. They're so flavorful and "sweet" like cherry tomatoes...and who doesn't love cherry tomatoes. I love the orange and red ones! 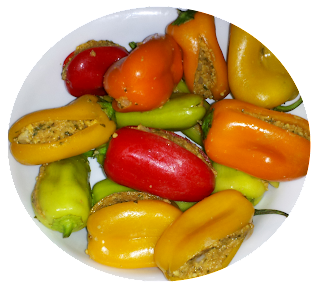 And since it was Hot and Spicy Food Day recently, we increased the "heat" of these peppers by stuffing them with Falafel. The sweetness from the peppers was a good combination with the Mediterranean spices and flavors. My mouth is watering just thinking about it. Make the falafel mixture as per instructions on the box and allow it to soak for 30 to 45 minutes. Then add the chopped onions into the mixture. Make a slit into the peppers without cutting them in half. Scoop about a tablespoon of the mixture and stuff it inside each of the peppers. In a shallow non-stick pan, heat oil, add all the peppers and sprinkle salt. Shallow fry the peppers under closed lid, turning them over in between for even frying. Remove from heat and serve hot! - The Tarazi Falafel Mix is the traditional Mediterranean vegetarian recipe made with ground chickpeas, fava beans and spices. It is also gluten free, dairy free and wheat free. Each serving size which is 2 oz has 12g of protein. That's a winner in our book. We found this product at our local Indian store. Another one of India's popular street foods that I love is Bhel Puri. 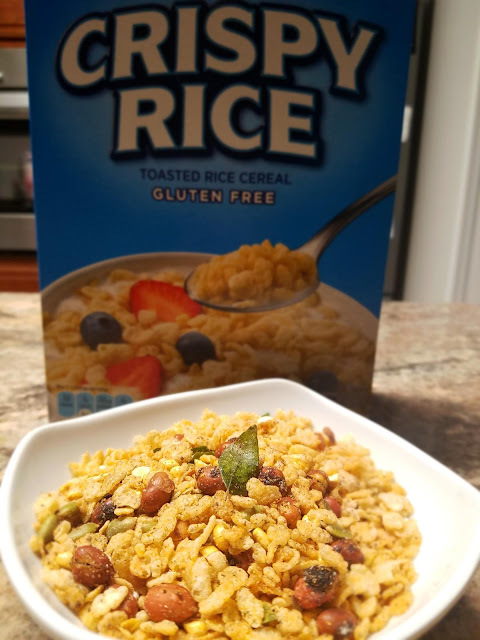 It has everything under the sun like spices, vegetables, lentils, nuts and puffed rice. Alas we're not in India and the only time I really enjoy eating this savory snack is whenever we got out to eat. I would love to make it at home, but we don't always have the ingredients. 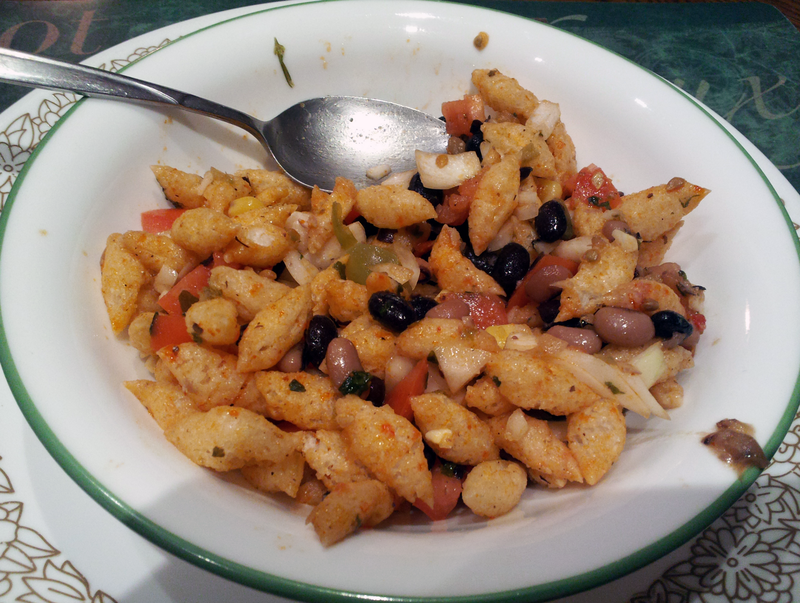 At a recent family party, my mom tasted this yummy bhel puri that was made with bean salad. Hm, there's a thought! When my mom got home, she told me all about the snack and we got busy in the kitchen. I love the way her mind works! 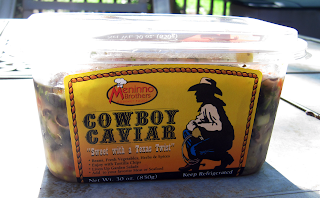 We found this delicious bean salad called Cowboy Caviar at Costco which was perfect for our version. It added a lot of flavor and color to the dish. Heehaw!! I'm ready for seconds! Although Cowboy Caviar has tomatoes and onions already in it, we added more for flavor and texture. In a big bowl, toss together the chopped onion, tomatoes and Cowboy Caviar. Then add the spicy mamra and mix well. The bhel puri is ready to be served and it's enough for 5 to 6 people, depending on the size of the bowl. Cowboy Caviar is a bean salad made by Meninno Brothers Gourmet Foods and is available at Costco. It's "Sweet with a Texas Twist"! It's made with black and white beans, vegetables, herbs and spices.